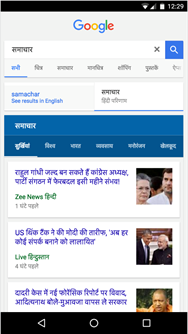 Home » Hindi search on Google app , Swap between English and Hindi on Google search » How to switch between English and Hindi on Google search? How to switch between English and Hindi on Google search? Are you interested to know how to flip or switch between English and Hindi on Google search via mobile phone? If so, nothing to worry, Google has recently announced the launch of a new tab on Google Search for mobile users to make it easier to switch between English and Hindi language. If you are looking for the same then find its detail over here. Yeah, this feature from Google is very useful for the smartphone users who search or translate from English to Hindi or vice-versa. This feature is granted for some listed and selected States in India with significant Hindi-speaking populations, this new feature will be avalilable from the Google Search app either Android or iOS mobile phoneS. How to shift between English and Hindi on Google search? It is very simple and friendly manner, you just need put query on place on that menu, for example, if you are looking for between English and Hindi on Google search then "type your query in English and then flip the tabs to read the answers in Hindi”. Users can even look up any information including health related tips and news and view the results in Hindi. Upon announcing the new feature in an official blogpost, Shekhar Sharad, Product Manager, International Search said, Users in India would now be able to search for information online the same way they live: moving between multiple languages depending on the moment or the audience. 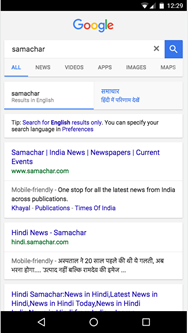 For example, users may search for “samachar” in English, but would rather find results better for a Hindi query “समाचार”. Yes, this feature and app might help many people across India who eagerly would like to read news or information in Hindi through Smartphone source on the move. This new tab search feature has just started rolling out for Mobile users (on all browsers except UC Browser and Opera Mini) in the following Indian states Bihar, Chhattisgarh, Haryana, Himachal Pradesh, Jharkhand, Madhya Pradesh, Rajasthan, Uttarakhand, Delhi and West Bengal and it will improve over time. I hope that you will enjoy using this feature and it helps you find the best relevant search results.